The Norfolk Medieval Graffiti Survey has been studying inscriptions at St Mary's Church, Lidgate, near Haverhill. 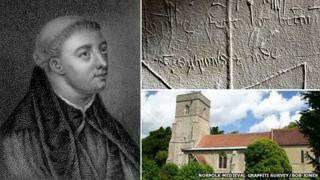 They are "90%" sure a newly-discovered graffito was made by poet John Lydgate (c 1370-1451), who had been vicar there. Matthew Champion, from the project, said: "He was known for his witty puns and many of these are of that kind." Lydgate, who became a monk in Bury St Edmunds and wrote The Lives of St Edmund and Fremund, is regarded as one of the most important and prolific medieval English writers with over 150,000 lines of verse attributed to him. He wrote verse for royalty, including Henry V and one of the church inscriptions alludes to Henry's wife Catherine of Valois. Mr Champion said graffiti chipped into church walls was an accepted practice and a lot at Lidgate were rebuses (cryptic puzzles) which had already been deciphered in the 1960s, without knowing who wrote them. The newly-discovered graffito, in Latin, translates as "John Lydgate - made on this day of St Simon and St Jude", which they believe provides evidence that a lot of the other graffiti could be his. "I would say we have the right name in the right place in the right handwriting at the right time - I'm 80-90% happy this was likely to be created by John Lydgate," said Mr Champion. Dr Karen Smyth, lecturer in medieval literature at the University of East Anglia, said she was in a "state of delirium" about the new discovery. She said: "This could be the earliest autograph of a literary writer that we have, but the fact that it's accompanied by a rebus about Catherine, would endorse speculation his poem The Temple of Glass might have been about Catherine. "He actually wrote more than Chaucer and Shakespeare combined and he acts as a bridge between the medieval and Renaissance periods." Reverend Brin Singleton, current vicar of Lidgate, said: "We don't encourage people to write on the walls these days - we have display boards instead - but many clergy did and as a result it was more theological than 'I was 'ere'. "It's fascinating that his verse could be inscribed, so hopefully it can be confirmed as Lydgate." The church surveyors said they hoped to provide further evidence that Lydgate was responsible as they continued trying to decipher other graffiti.